This online program will prepare you to become a productive member of a veterinary team. 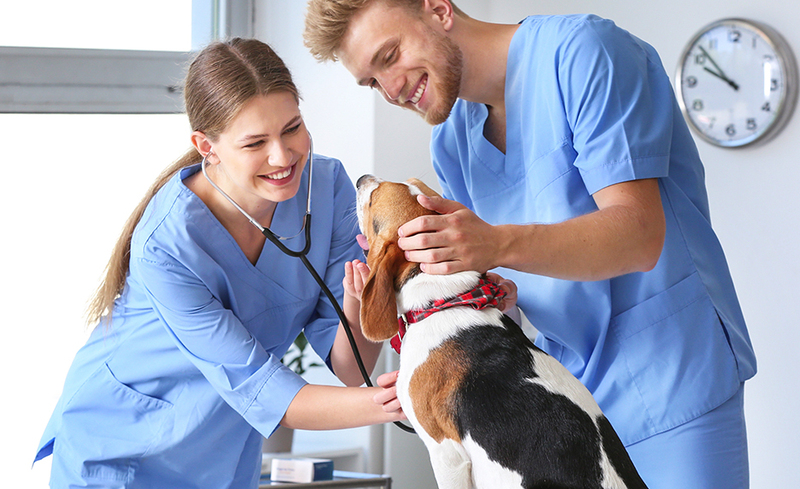 You'll learn about every aspect of veterinary assisting, including anatomy and physiology, animal restraint, laboratory sample collection, assisting in surgery and dentistry, prescription preparation, and taking radiographs. You’ll also learn how to interact professionally with clients and gain the expertise you need to educate them about key topics in pet care, such as nutrition, vaccinations, and administering medication. This program is designed for people who want to work at a veterinary hospital and those who are already employed in positions in which they look after animals. The anatomy and physiology of the major organ systems. How to handle medical records and communicate with clients and coworkers. How to restrain animals for procedures, take vital signs, and bathe them. All about nutrition, vaccinations, and administering medication. How to assist during surgery and dental procedures. Preparation of prescriptions and taking blood samples and radiographs. Upon passing this course, you’ll have the credentials and knowledge to be a valued team member in a veterinary hospital. You will be able to use your instructor as a professional reference. Assistance from our Externship Coordinator and access to our Externship Starter Kit. You’ll first study the major organ systems that you’ll need to know about as a veterinary assistant. Next, you’ll move to front office duties so you can see how to work with clients and handle medical records. You'll also delve into the communication skills that come in handy for the assistant. Then the program moves to the area you're probably most interested in—the back of the hospital. You’ll see how to restrain animals for procedures, take their vital signs (temperature, pulse, and respiration rate), trim their nails, and properly bathe them. You'll also gain the expertise you need to educate clients about key topics in pet care, such as nutrition, vaccinations, and administering medication. The program also shows you how you can be an asset during surgery and dental procedures by monitoring heart rate and breathing, passing instruments to the surgeon, and charting teeth. You’ll learn how to prepare prescriptions, take blood samples, perform laboratory tests, and take radiographs. The program concludes with a lesson to prepare you for the job market, in which you'll see how to create an effective resume, advance your skills, and develop strong interview skills. Upon passing this program, you’ll have the credentials and knowledge to be a valued team member in a veterinary hospital. This program is compatible with Windows, Mac, and a variety of browsers and browser versions. You will need Adobe Flash and Adobe Reader. You will need an Internet connection (high-speed is recommended) and email capability. A high school diploma or equivalent is recommended but not essential. Yes, because ed2go programs are online, you never have to actually travel to the school. Most schools offer telephone or online registration. Upon successful completion of the program, you will be awarded a certificate of completion from the school. ed2go programs will provide you with the skills you need to obtain an entry-level position in most cases. We don't provide direct job placement services, but our career counselors will help you build your resume and are available to give advice on finding your first job. Instructors will also be available to use as a professional reference upon completion of the program. Potential students should always do research on the job market in their area before registering. Each student is paired up with an instructor for one-on-one interaction. The instructor will be available (via e-mail) to answer any questions you may have and to provide feedback on your performance. All of our facilitators are successful working professionals in the fields in which they teach. 12. Does this program provide veterinary assistant certification? The National Association of Veterinary Technicians in America has a certification program that began in 2012. Currently, this requires attending a college that also has a veterinary technician certification program. Once NAVTA creates a way for online programs to lead to certification, we will be exploring this avenue. 13. Can I work at a veterinary hospital with the training from this program? Yes. The duties that each member of the hospital can perform are regulated by the licensing board for that state or province. By taking this program, you will obtain a veterinary-specific skill set. This will put you far ahead of other applicants who haven’t shown the desire and ambition to take a program like this. This, along with your work ethic and personality are the factors that come into play in getting a position at a veterinary hospital. 14. Does this program prepare for any state licensure? No, this program does not prepare for any state licensure. In addition, students will not participate in any fieldwork experience during the course of this program. I loved that I could do my classes any time of the day...being a military spouse I don't have a lot of free time, most of the time! I wouldn't change anything! I loved it and was satisfied with everything!! I very much enjoyed this course and feel that I am walking away with a wealth of knowledge in this career field. I loved being able to complete assignments and work at home. I am a single mother of two children and cannot afford to put them in daycare so staying home with them while I completed the course saved a lot of money. I was able to spend much needed time with my girls! I really liked the fact that it was all based on my own schedule and I did not feel rushed or stressed about homework assignments or tests. My instructor was wonderful! She checked in to see if everything went the way it should and made sure everyone knew they could ask any questions that they had! I like how this program is self-paced and how quickly everything is graded. The facilitator always got back to me in a timely manner and I feel that I learned a lot. Dr. Grognet is an excellent facilitator. The course content was extremely meaningful and relevant because Dr. Grognet authored the learning modules - and he appeared/demonstrated in course videos. The course content and assignments were substantive and challenging. His credentials, professional experiences, and passion for veterinary medicine are inspiring for students. The feedback received from Dr. Grognet was very timely and individualized for the student. He demonstrates professionalism and style. Lastly, the online learning platform was student friendly - ease in navigation and understandability. An excellent with distinction - program and facilitator! I really enjoyed the way in which the material was represented. It was fun to learn with the review games and helpful pictures. Also my facilitator was helpful in answering my questions. They answered them quickly and with much description.